As an advocate for Genius Hour, I am very passionate about the concept. But, I will be the first to admit that my facilitation of Genius Hour often does not go well. One area that has been somewhat unsatisfying has been the final presentation stage. Many of my students get bored listening to the other students’ spiels, and, amazingly, forget all about this when they are in front of the class and do the exact same, boring things – completely oblivious that they are causing a huge YawnFest of their own. The most effective strategy was the last one. If you have not seen the Slideshare presentation called, “What Would Steve Do? 10 Lessons from the World’s Most Captivating Presenters,” click here. One of the important precepts was to spend an equal amount of time on planning, creating, and rehearsing the presentation. Reiterating this quite a few times, I definitely saw improvement toward the end of the year as students realized they were spending the bulk of their time on creating, and practically no time on rehearsing. 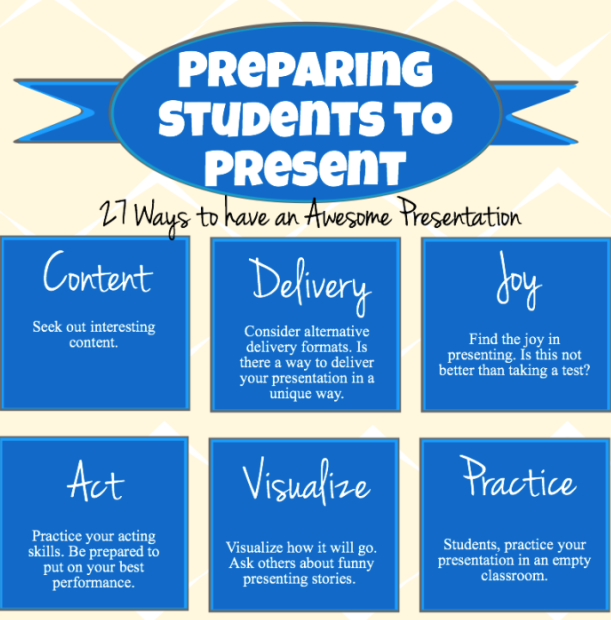 This neat graphic that I found on Edudemic would also be helpful for encouraging quality presentations. I have just placed a portion of the poster here, and you can click here for the rest of the suggestions. Two of my favorites? Find the joy in presenting, and interact with your audience. Let’s see if we can keep those yawns to a minimum.